Volume 4, page 139, sitting number 4627. Prince Louis of Hesse first met Princess Alice in the summer of 1860 at Windsor Castle, and on the Prince’s second visit in November they were formally engaged. Although Lord Clarendon described him as ‘a dull boy from a dull family in a dull country,' and the Duchess of Cambridge considered it ‘an insignificant match.' Alice herself thought him delightful, while Queen Victoria described him as ‘a dear, pleasant, bright companion, full of fun and spirits – so quick-witted and I think him so good looking.' The couple were married at Osborne on 1 July 1862, shortly after the death of Prince Albert, the bride wearing a black trousseau. Queen Victoria herself remarked that the ceremony was more like a funeral than a wedding. The couple went to live in Darmstadt in as English an atmosphere as the Princess could fabricate. 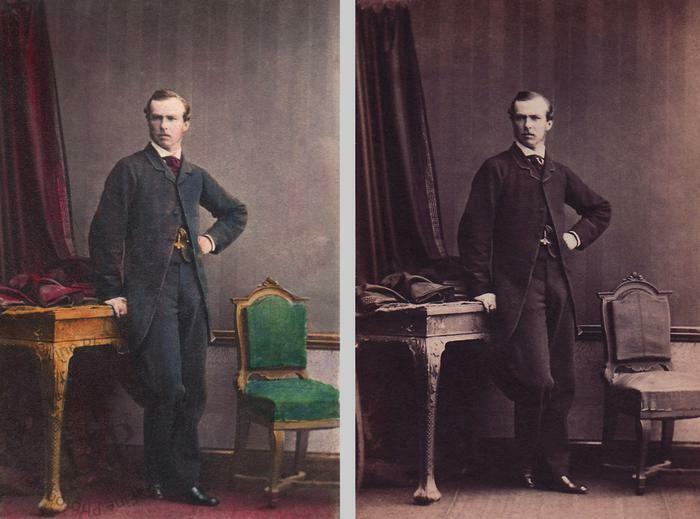 In 1877, Prince Louis succeeded his uncle as Grand Duke Louis IV of Hesse and the Rhine. He died in 1892 after suffering a stroke.